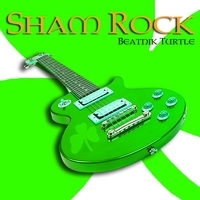 Beantik Turtle's album, Sham Rock (A compilation of rocked-out irish drinking songs made for RPM) was nominated for the Just Plain Folks (JPF) Music Awards in the Celtic category. This is a peer-reviewed award. And we were one of over 42,000 albums submitted. Less than 1/3 of 1% get nominated: that's some kind of crazy fraction I can't figure out using Verizon Math. Obviously, we're pretty floored and appreciative. Thanks to JPF and to all our BT Fans!